Tranquil Park Tranquil Park’s Wedding and Reception Venues are nestled on the southern escarpment of Queensland’s beautiful Blackall Range with stunning views to the Glasshouse Mountains. We have all the beauty, serenity and romance that only a pristine mountain atmosphere can provide. With the benefit of experience we can help you with every detail of the wedding planning and our facilities enable us to handle everything from small intimate weddings to larger weddings with up to 200 guests. The Mountains Deck Function Room is located next to our Al a Carte restaurant and also shares the views of the magnificent Glasshouse Mountains and is ideal to cater for smaller wedding parties. This room accommodates a maximum of 70 guests for your wedding reception. The room has its own entrance and deck and can be separated from the Al a Carte Restaurant. Maleny Hotel Under new management in 2018 the Maleny Hotel has been transformed. Now offering creekside accomodation and relaxed Bistro or marquee style wedding receptions. Have your wedding ceremony at Little White Wedding Church and be transported by courtesy bus for a relaxed reception at Hotel Maleny. Be captivated by the stunning scenery, right on the OBI OBI River, which creates the perfect backdrop for your wedding reception and photography. Brouhaha BROUHAHA – The brewery and restaurant offer a versatile function space to suit any style of event. If you want the brewery all to yourself they offer full and half venue exclusive hire. Or if you are planning something a little bit smaller, they have a range of function packages to suit any size. 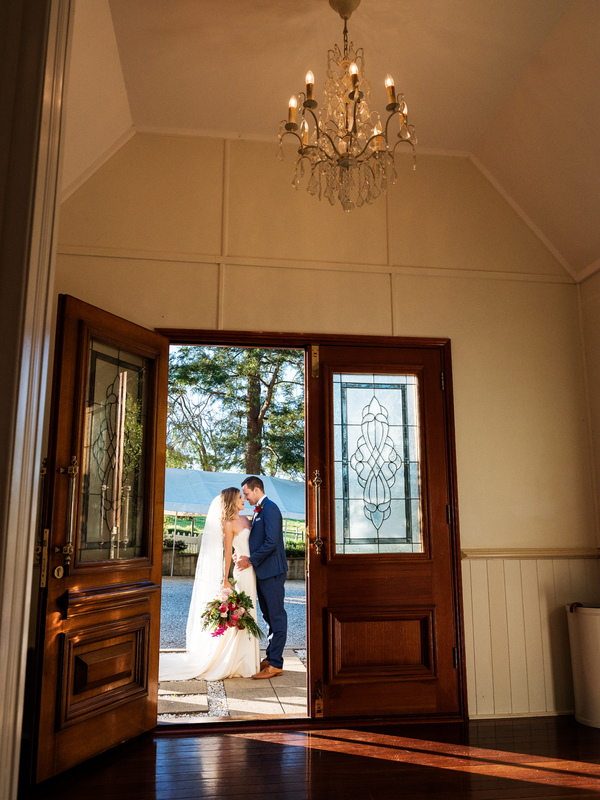 The Orangery Located in the heart of the Hinterland The Orangery Maleny can create the wedding of your dream. From small intimate weddings to large functions up to 80 people we will look after every aspect of your day and pride ourselves on our exceptional service and attention to detail with fabulous creative ideas, tips, guidance and regular support. Seats up to 80 Guests. Spicers Clovelly Everyone knows that a wedding should be special, but at Spicers Clovelly Estate they also believe it should be unique. The romantic Sunshine Coast Hinterland setting, beautiful reception venue, lush gardens, award winning food and expert service provide the essential ingredients to make your special day perfect. Best of all, Spicers Clovelly Estate offers exclusivity for your wedding and the opportunity to have guests stay on site in the 13 luxurious guest house suites. Whether you are planning a seated reception for up to 80 guests on our Library Deck, or 120 guests in a stylish marquee, relax and leave yourself in the hands of the friendly, expert staff. Altitude on Montville Nestled in the Sunshine Coast hinterlands, Altitude On Montville offers the newest most sophisticated wedding venue, and the most stunning views. Exquisite dining, modern décor and first class function management ensure your wedding reception is delivered down to the finest detail. Their passion is to work with you to achieve everything you desire for your dream wedding reception. You are welcome to visit for a guided tour of the venue. Maleny Manor Encircled with windows taking in the expansive garden and valley views to the Sunshine Coast. It provides a subtle ambience while creating an elegant relaxed, country feeling. With its neutral colour, elegant cornice finishes, fireplace, central atrium with enormous Oregon beams and warm timber staircases the room offers itself as the perfect reception room all year round. Opening to the lawns and covered walkways it is the perfect secluded country estate to “Feel at Home” and celebrate with those you love. Accommodating 120 guests for formal dining and dancing.